The third tropical storm in the North Atlantic, Cristobal, has been making some headlines about its potential positive impact on us here in the UK – so what’s actually happening? Cristobal is currently categorised as a hurricane and is currently between Bermuda and northeast Florida in the western Atlantic. The storm is forecast to move north-east across the Atlantic over the coming days, changing to an ex-hurricane as it moves away from the warmer waters where it formed. However, unlike ex-Hurricane Bertha which moved straight to the UK and brought strong winds and heavy rain to much of the British Isles, ex-Hurricane Cristobal is set on a very different track. Instead it is forecast to move towards Iceland, staying well away from the UK as you can see from the forecast pressure chart below. 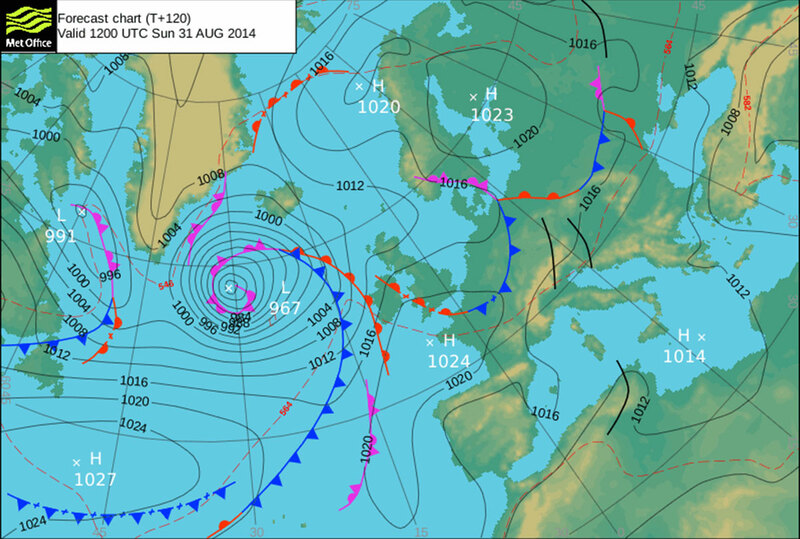 Forecast pressure chart for 1pm on Sunday 31 August shows ex-Cristobal heading towards Iceland. As Cristobal tracks to the north-west of the UK it could bring stronger winds across northwestern parts of Scotland for a time and there will also be some rain moving across the UK on Sunday into Monday. It will have a longer lasting and more positive impact on our weather, however, as the track of the storm will result in an area of high pressure building further to the south and over the UK. This high pressure will be maintained through next week as the jet stream moves to the north of the UK, bringing settled conditions across the country. At this time of the year, high pressure generally brings dry and fine weather with some spells of sunshine, and that’s what we expect to see from around Tuesday next week. With high pressure, daytime temperatures could reach the low to mid 20’s Celsius in places. This warmth will be especially noticeable following the cool conditions of late. This spell of warm weather, however, doesn’t fit the definition of an Indian Summer – which you can read about on our website. This entry was posted in Met Office News and tagged Autumn, cristobal, hot, hurricane, indian summer, Met Office, summer, sunny, tropical storm, UK, weather. Bookmark the permalink. 2 Responses to How will ex-Hurricane Cristobal affect the UK’s weather next week? how long will the warm weather last after next week?